It’s Christmas Day. The fire is on, the presents have been opened and the floor is now littered with discarded paper among which runs a very excited dog. Hungry after the morning’s excitement, we all pile into the kitchen and make a start on breakfast. Some of us have cereal, others have kippers but for me my meal of choice is smoked salmon with scrambled egg. I look forward to this breakfast every year, I even made sure I had it when I was away in Australia over Christmas a few years ago. This year, however, I’m not so sure. When it comes to the consumption of salmon, the UK salmon fishing industry seems to be booming. With constant reports of the health benefits of these fish and the ease of buying, more and more people appear to be enjoying it. However, whilst on the surface there appears to be no shortage of demand, the industry is facing many serious issues. The vast majority of the salmon we consume comes from fish farms, many of which are found in the Scottish Highlands. In these farms, huge circular pens lie close to the shore and can contain around 70,000 fish per pen. As you can imagine, with so many fish in such close proximity to each other, when disease occurs, the effects on the shoal can be devastating – something that has been seen in recent months. Last year alone, the Scottish fish farm industry admitted to disposing of up to 10 million salmon after being plagued by parasites and disease. Described as being “an environmental catastrophe” by campaign groups, the loss of these fish not only demonstrates the damage that can be done by disease, but also suggests that it may be spiralling out of control. Shockingly, in the first half of this year, already 7,700 tonnes of dead fish have been reportedly disposed of in the Western Isles of Scotland. Whilst it is not uncommon for there to be illness within fish, for it to have had such a horrific impact on the farms and with three successive years of rising levels of mortality in 2014, 2015 and 2016, clearly control has been lost somewhere along the line. But what can be done? The leaching of chemicals into the surrounding wild waters is already a serious issue and so it goes without saying that any increase in this would be dangerous. However, while disease remains prominent within these densely packed pens, there is a real chance that these illnesses will continue to breach the farm boundaries and pose a real threat to wild salmon and other fish. In recent news, it has been reported that salmon being sold in supermarkets haves been breaching the recommended levels of sea lice, a type of fish parasite. Whilst they don’t pose a direct threat to us, the fish discovered to be suffering are either discarded or treated. It yet again highlights the tremendous loss the farms are facing. The salmon on one of the farms were found to have around 23 sea lice each, way above the recommended limit of one per fish. This highlights a major issue and one that must be rectified. Disease control and prevention is a tricky situation but Dr Richard Luxmoore of the National Trust for Scotland, has come up with a solution. He claims that the best way to proceed would be to create a “closed containment system”, a step also advised by Salmon and Trout Conservation Scotland. By separating the farmed fish from open waters, not only would the wild marine environment be protected but they would be too. There would be little risk of disease being passed between fish and the chemicals and antibiotics used to prevent and treat them would also be prevented from bleeding into the surrounding habitats. At a time when fish farm disease levels are rising and its impact on the wild world still ultimately remains a mystery, perhaps now is the time to give this a go and prevent the issue from escalating. 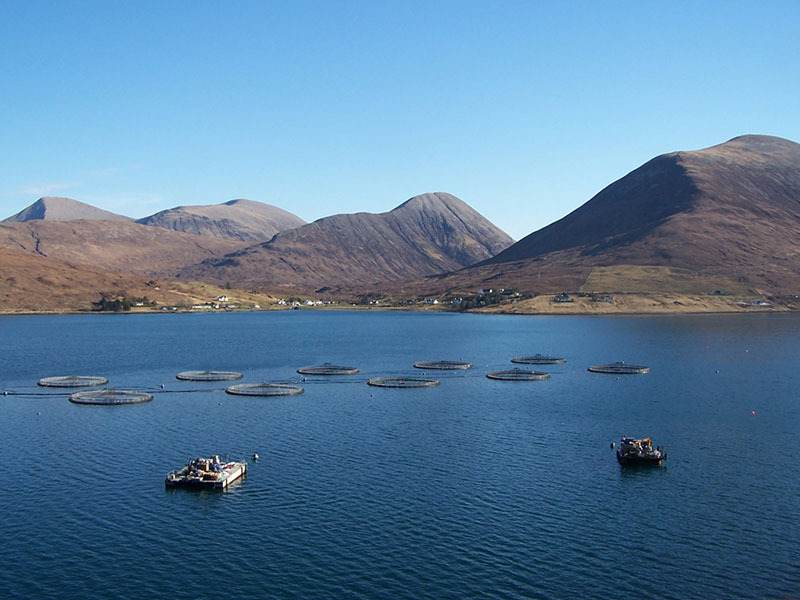 Parasites and disease are clearly very damaging to both fish farms and the surrounding environment but how else do salmon fish farms have an impact? Well, it may come as no surprise that salmon farms in the Highlands of Scotland are often attacked by seals. With pens full of salmon just ready to eat, these highly efficient predators attack the pen nets and cause extensive damage. According to the Scottish Salmon Producers Organisation, when the seals strike they can kill huge numbers of the fish and can also severely stress those who find themselves able to escape. As a result, many of these fish die which can be a significant loss to business. For those fish who are able to escape and survive, they are free to roam around the wild waters and can subsequently pass on dangerous diseases to their wild counterparts; another unwelcome consequence of seal attacks. In order to combat these problems, many fish farmers use thicker more impenetrable nets and “seal blinds”, a type of net with smaller mesh that stop the seals being able to see in. Unfortunately, however, if these methods fail, then farmers are permitted to shoot seals on site. In a report released by the Scottish Government, one of the major salmon suppliers based in Scotland, Marine Harvest, admitted to shooting 21 seals in 2016 alone, and figures released by the Seal Protection Action Group suggest that over the past six years, over 1,500 have been shot. In an already dwindling population, the loss of any seals can be devastating, and so it may come as some sort of relief that this must only be used as a last resort. To reduce the number of seal deaths associated with salmon pens, farmers have been utilising other, newer methods to discourage attacks, including using acoustic deterrent devices (ADDs). More than 130 farms now use these tools but whilst they may be contributing to the decrease in seal deaths, they have the potential to cause further issues to the marine world. The use of ADDs is currently unregulated in Scottish waters, and lochs, quays and oceans are now filled with noise; something which can be incredibly damaging to both seals and cetaceans. Not only do these high sound levels have the potential to alter their behaviour, it can also cause hearing damage which, for animals who rely upon echolocation to hunt, can be life threatening. Scotland is home to many vital habitats for the harbour porpoise, minke whale and many other wonderful marine animals, and so any issue within these areas could have devastating consequences. Although we don’t know yet to what extent the noise from these devices cause damage and disturbance, further research is needed to establish whether or not this is the case. There is, of course, the potential for it. In an already noisy world full of shipping and drilling noise, the decision must be made as to whether the welfare of the farms is on balance with the welfare of the ocean. Salmon fish farms are facing rough waters ahead. Already struck down by increasing disease, parasites and public backlash and calls to halt the construction of new fish farms, changes have to be made to secure the successful aquaculture business industry. Fish need to receive better treatment. Being crammed in a small, unhealthy pen is undoubtedly unacceptable, and the animals living around these vast farms may also be affected. More research needs to be carried out to decide whether the impact of ADDs is truly harmful, and other options for seal discouragement should be explored. We need to remain aware of how these fish are treated and what is being done to improve their welfare in an industry in Scotland worth an estimated £620 million. For me, Christmas morning may be very different this year. I’ve learnt a lot more about the conditions in which the salmon are kept, and whilst supermarket packing may claim that the salmon are well looked after and the business sustainable, I’m not so sure any more. Perhaps this year, toast will do for me…..